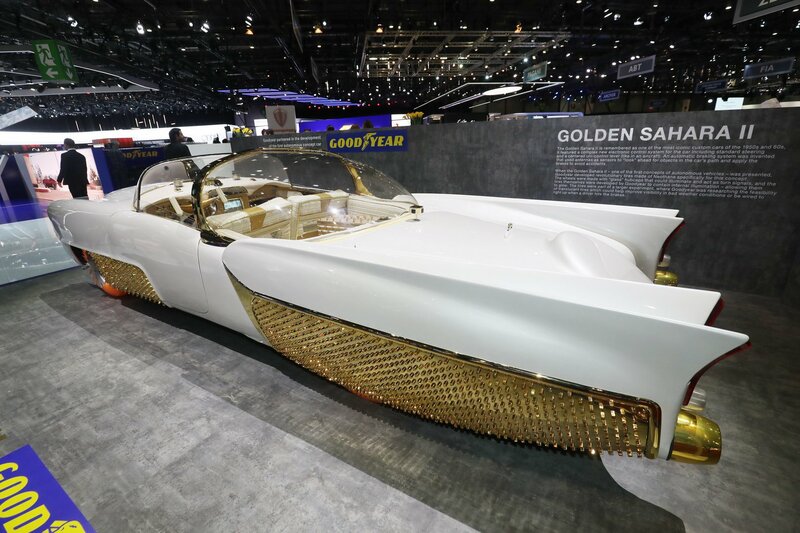 Goodyear and Klairmont Kollections have come to this year’s Geneva show with quite an ace up their sleeve: a unique retro car called the Golden Sahara II. The vehicle has caused quite a stir among the guests and the media alike. The white-and-gold luxury sedan is based on a 1953 Lincoln Capri that originally belonged to famous tuner and Batmobile inventor George Barris. After a few years of driving it, Barris got into a traffic accident with a truck and, while he miraculously came out of it alive, the car had its entire roof ripped clean off. Barris wanted to restore the vehicle at any cost and contacted his fellow tuner, Jim Skonzakes, to carry out the job. The guys fitted the car with a half-bubble roof and painted parts of its body with a unique pearlescent gold paint made from processed fish scales. They left the rest of the body and the cabin foam-white for maximum visual appeal. The restored car made it to numerous U.S. motor shows and exhibitions and was invariably met with high praise. In the late 1960s, Barris and Skonzakes decided to spruce things up a little bit further and fitted the car with electronically-selected drive modes, transparent Goodyear tires with backlighting, an aircraft-styled control lever, and front bumper-mounted emergency brake sensors – truly revolutionary things to have on a motorized vehicle in the mid-20th century! However, the star of the resplendent Golden Sahara II was still slowly setting, and after a while, it vanished from the public eye altogether. A couple of years ago the Sahara Mk2 suddenly popped up at an auction sale, and Klairmont Kollections wasted no time in acquiring it. It then commissioned a complete restoration job with the Chicago-based tuner Speakeasy Customs and Classics and brought the revived vehicle to the 2019 Geneva show.